We've been home for a number of days now. Home is good! I couldn't wait to get back into my sewing room..., yet I haven't sewed one stitch yet! There are many things that I need to get caught up on...paperwork, organizing a number of items, working more on my sewing studio... My dh bought an eliptical trainer that will reside in my sewing studio (which use to be his office). Every Sunday night we have a family dinner for whoever is around and able to come. It has become a highlight in our week. Over the holiday is was incredibly special to have all four sons and their girls....around. Now we are back to two sons and the girls. It means so much to us when Jon's and Mark's girls come! We miss our boys, but having their girls around eases the hollowness of their absence. For tonight's dinner my dh has been working on a great dinner taken from "Jamie's Italy" by Jamie Oliver. What a cookbook! 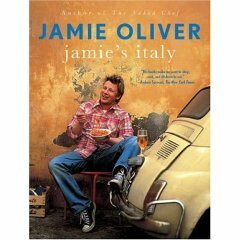 I just LOVE Italy...the food, people, country...this cookbook captures the heart of Italy. Tonight's menu: peposo (the famous hunter's peppery beef stew), garlic mashed potatoes, grill veggies with a New Mexico inspired dessert: green chili apple crisp served with extra sharp cheddar cheese.